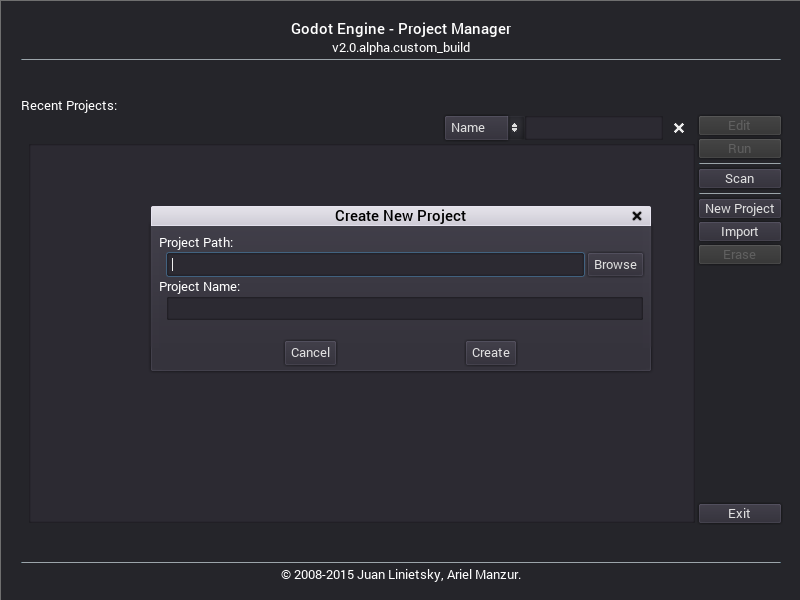 Godot is an opensource game-development engine and editor. I love games. I love opensource. I’ve been thinking for a long time about starting to create small games. So here it is: I’m going to finally test it. Good, with that out of the way, I can now start. It’s 23:57 in Paris, I’m alone and there’s some Pink Floyd in the air, let’s do this! First thing first, we need to install Godot. I’ll compile from sources, because I always love to have all the brand new shiny not-quite-working-yet features. 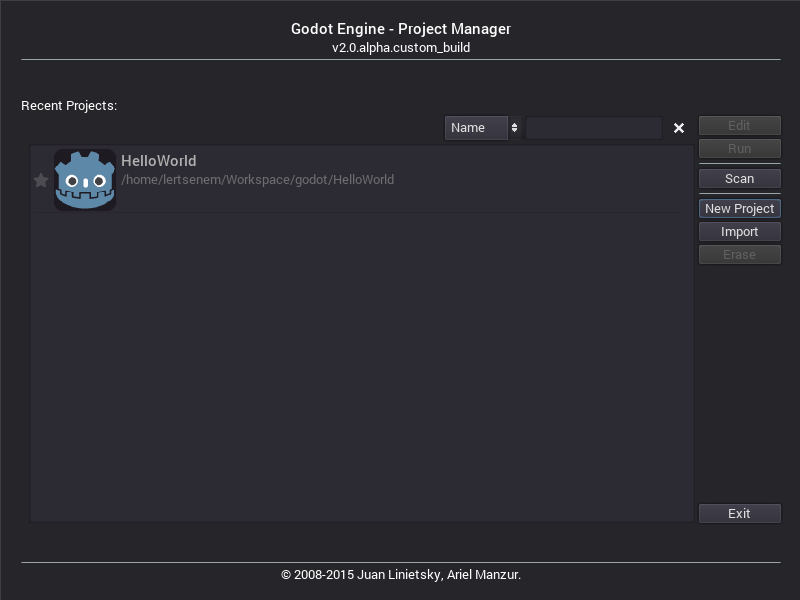 The source code of Godot is available on Github at https://github.com/godotengine/godot. remote: Counting objects: 27037, done. remote: Compressing objects: 100% (506/506), done. Réception d'objets: 100% (27037/27037), 67.50 MiB | 1.28 MiB/s, done. Résolution des deltas: 100% (17874/17874), done. Excellent. Let’s see that README to find out how to build. Following the links, I finallyt get to this page, which is what I was looking for. Now I just need to follow the described process blindly. First we need to install the dependencies. Godot apparently uses SCons for compilation. Unfortunately I’m not familiar with this build system. At this point in the process, depending on the speed of your CPU, you may want to go grab a coffee. For myself, while I’m waiting for Godot to compile, I will make a quick search about SCons. SCons is a build system for automatic software construction (like make and autoconf) that uses Python scripts for its processes and configuration. In the file above, Program() is a Python call, taking the name of the file to build as parameter. The name of the built object is automatically deduced. The default compiler is used. How cool is that? And a window pops up. This looks like a project creation/selection wizard. I’ll try to create a New Project. I obviously have to provide a path for the root of my project and its name. How about a HelloWorld Project ? The path must exist, Godot won’t create the directory for you. I must say I like that very much. And here is my new Project, freshly created ! I select it and it’s time to see what’s inside Godot. I think the main area is for the Scene edition. 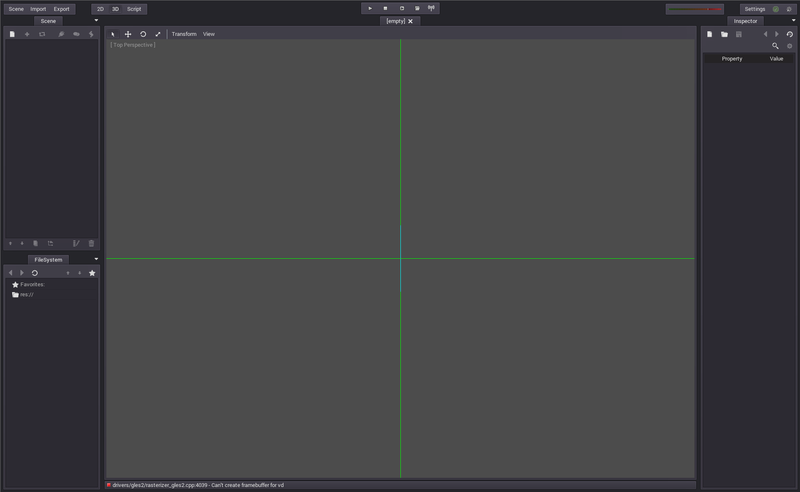 On the top left, the Scene panel allows to add objects (which are also Scenes if I remember correctly what I read about Godot earlier) to the current Scene. On the bottom left the FileSystem panel is self-explanatory. On the right, the Inspector panel should be to edit the properties of objects in the Scene. A new window pops up and ask me to Create a new Node (okay, so it seems I was wrong, and I should talk about Nodes rather than Scenes). There’s a lot to chose from, fortunately there’s a search box to filter the results, so I look for "text". And here it is: a RichTextLabel. Probably what I was looking for. When I select it, it seems to be added to the Scene: I can see it in the main window, with a red border (probably means it’s selected right now). Because I like to make my projects clean, I rename the Node "HelloWorldLabel". You can do that by double-clicking the Node in the Scene Panel. Messing around in the Inspector panel, I set the Bbcode/Enabled property to On and I write "Hello, World!" in the Bbcode/Bbcode property. On the main panel, the Scene now shows my RichTextLabel with the text I just typed in it. Somehow I’m not sure that as the right thing to do, but that still did the trick. Now I want to test my (highly conceptual) video game. On the top of the editor, there are some symbols that I guess are just made for that purpose. I press the play button 1. An alert box ask me to save my Scene before trying to play it and I oblige. Your project only have access to the file inside the directory you specified when creating the project. When I save my Scene here, it’s at the root of my project, in /home/lertsenem/Workspace/godot/HelloWorld. I enable it and browse the files to select the Scene I saved earlier. Note that the path reads res://HelloWorldMain.scn: again, the resources are all located relatively to the root of the project. Okay, that’s enough for now, I’ll improve on that later. Before leaving Godot for now, I still have a question: what are the files I just created with my project, my Scene and the "Hello World" Node? To answer that, I list the root directory of my project. There’s not much, I will review the files one by one. That’s just a config file containing the properties of my project. I can see the main_scene property I defined earlier. The icon.png file is just that: a default icon for my game. The icon.png.flags is a text file that list flags (well, just the one here actually) that must be referring to how to use the icon.png image. Now the main file, the one describing my Scene. Yey, it worked ! My Scene is now a regular XML, text-based file, which is great for version control. Before initiating git inside my project though, I will try to make some changes in the terminal to see if it still works with Godot. 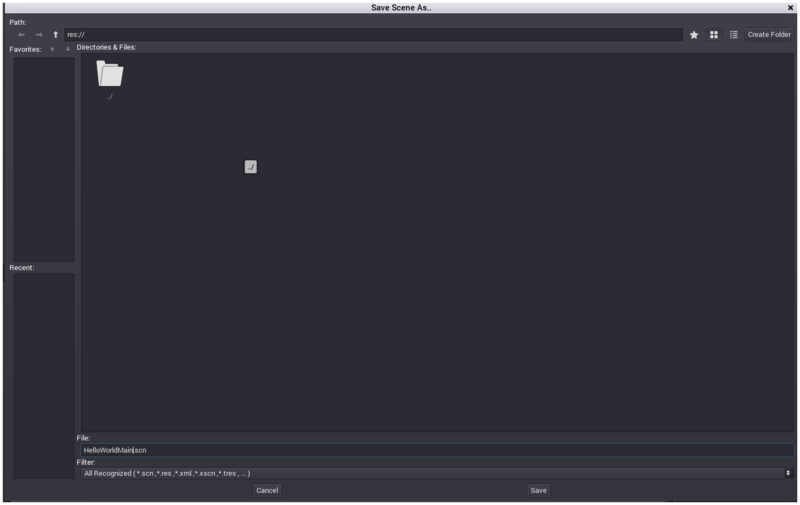 I restart Godot, and it works, my modifications are correctly taken into account! I like the fact that I’m not forced to use Godot to edit my files for each small modification a lot! 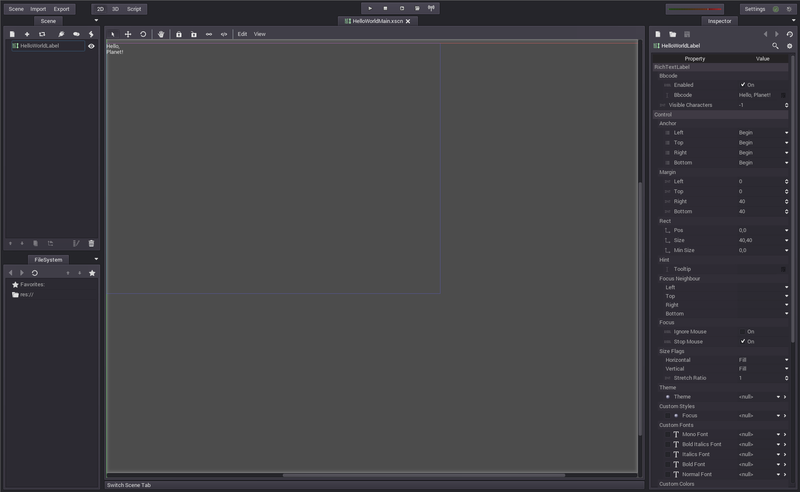 And that will probably come handy when adding scripts to my game: as much as the Godot built-in IDE is good, nothing beats your own IDE2. That’s the end for the night, and Gorillaz replaced Pink Floyd. I’ll just init a git repo inside my project before leaving. You can see the git repo here (the TLS alert is normal, I use self-signed certificates and I did not have the time to mail Mozilla, Google and Microsoft my CAs ;)). While writing this post, I found a tutorial describing almost exactly what I just did, with better screenshots than those I used nonetheless. This howto is part of a larger serie about Godot, which is really worth a read. And of course, the official website I already mentionned at the beginning of this post is full of informations and documentation. I’ll leave you there, see you next time. As always for comments, suggestions or insults, use my twitter account.